You could call this a tale of two seasons for Florida and LSU, two basketball teams heading in different directions. The Gators were expected to hover around number one all year and win the SEC championship. They haven’t disappointed. LSU was expected to be a top five but the Tigers are in the tank. They’re 3-10 in the SEC and clearly the most disappointing team in the nation. Florida is 25-3 overall, 12-1 in the SEC and ranked third in the nation. Barring an unexpected collapse in these final three regular season games, the Gators are closing in on a number one seed in the NCAA Tournament. If they can finish the season on a roll, Florida would have to be considered an odds-on favorite to repeat as NCAA champions. LSU, on the other hand, is 14-13 and hoping to finish with its head enough above the water that it can make the NIT field. The Tigers are 1-9 in their last 10 games and they’ve lost their last three. They are 12-4 at home, which is some consolation, but unfortunately, they can’t play all their games at the Maravich Center. To have any shot at all of making the NCAA Tournament, the Tigers probably have to win their final three regular season games starting with Saturday’s matchup at the Maravich Center with the Gators. They would need to follow that up with a strong showing in the SEC Tournament. Two wins might not be good enough, but three — especially if LSU closes out with three straight wins at the end of the regular season — would right the ship. After last year’s visit to the Final Four nobody would have guessed that LSU would need a five or six-game winning streak at the end of the season just to get on the NCAA radar. At the other end of the spectrum is Florida. 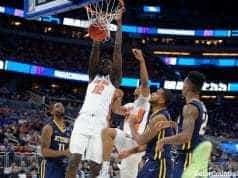 If the Gators win their final three SEC games and follow that up with their third straight SEC Tournament championship they will be mortal locks for not just a number one seed in the NCAA Tournament but the overall top seed for the 65-team field. That overall top seed is important because that means the first round game is against the winner of the play-in game. There are light years of difference between number one and numbers 64 and 65. Florida and LSU both started the season with such high expectations but the Gators have handled the pressure well while LSU has folded. Florida’s five starters from last year have performed at a level that’s not all that different statistically than the team that went 33-6 and beat UCLA for the national championship last March. With their experience and ability to win the tough games, it’s hard to argue that Florida isn’t the team to beat in the NCAA Tournament. For LSU, you have to wonder how it ever got to this point. They have impressive athletes up and down their roster and in Glen Davis and Tasmin Mitchell they have two of the more talented front court players in the country. At every position except the point, LSU has an impressive athlete but it’s at the point where you can see the origin of the LSU collapse. Once teams discovered that Garrett Temple couldn’t handle the press, the Tigers have faced unmerciful 94-foot pressure. Last year, the lightning quick Daryl Mitchell spearheaded LSU’s run to the Final Four. This year, Temple is a stop-gap measure at the most critical position on the court. His play against Kentucky’s full court press Tuesday night was painful to watch. LSU raced to a 28-12 lead before Coach Tubby Smith started attacking Temple with double teams in the press. Next thing the Tigers knew it was 33-30 in Kentucky’s favor. To LSU’s credit, the Tigers have played everybody tough even in the last ten games. That’s because the Tigers are one of the best in the SEC on the defensive end of the floor. They’re holding opponents to 40.2 percent from the field and 35 percent from the three-point line. Florida is also holding opponents to 40.2 percent from the field. The Gators are holding opponents to 29.4 percent from the three-point stripe. Saturday, don’t expect a pretty game when the Gators take the floor against LSU. Expect a defensive battle with the difference in the backcourt. If Florida goes to the press early, it could turn into the type of game that Corey Brewer and Taurean Green have a field day. If LSU gets the ball across mid-court, expect the Gators to show more zone than usual. Terry Martin is the Tigers’ only consistent outside scoring threat and he’ll be locked up with Lee Humphrey most of the day. Humphrey has proven all year long that he’s as good defending on the perimeter as there is in the SEC. Joakim Noah joined the 1,000-point club at Florida when he scored six points against South Carolina. Al Horford needs 44 points and Lee Humphrey needs 49 to join Noah, Green and Brewer with 1,000 points for their career. To have five players on the same team with 1,000 points in their careers is a remarkable achievement and a testament to the unselfishness of the team. To have all five players make the 1,000-point club in the SAME season is unheard of. It might have happened before, but so far nobody’s produced any research to show that five players on the same team have ever gone over the 1,000-point barrier in the same season. 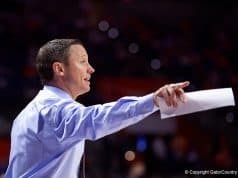 When Vanderbilt’s fans stormed the court last Saturday after the Commodores upset then number one-ranked Florida, the Southeastern Conference moved quickly to levy a $25,000 fine for a second offense (Vandy fans stormed the court after an NIT win against Western Michigan last year). The first reaction is to applaud the SEC for a policy that hits a school in its wallet for failing to provide adequate security, but upon further review, do you really think $25,000 is an adequate deterrent particularly when the president of the school (Vandy’s Gordon Gee) joins the mob and storms the court? Gee sent two signals last Saturday: (1) who cares about the rules and setting the right example? and (2) $25,000 is nothing compared to the rush of storming the court. Vandy knew it would get fined but thought so little of it that the vice-chancellor, David Williams, laughed about it, shrugged his shoulders and gave the kids will be kids response. Who cares that someone might get trampled? It’s happened before but obviously that’s not a concern at Vandy which tried to explain that its storming fans were quite polite. Tell that to Brandon Powell, the Florida guard that was caught in the middle. Pushed and shoved from all angles, he reacted with a punch. Consider if fans stormed the floor after beating LSU and Big Baby, Glen Davis, reacted with a punch if he was being jostled and shoved around. Big Baby is 6-9, 290, and strong as an ox. Someone’s face could be caved in so far that all the plastic surgery in the world couldn’t help. Vandy had nearly 15,000 fans at the game so that fine cost the school somewhere around $1.67 per fan to let them run onto the court for their post game celebration. Their first offense last year was a $5,000 hit. That would be about 50 cents a person if the Kentucky faithful decided to storm the court at Rupp (they were actually debating it a couple of weeks ago when the Gators played there). $5,000? $25,000? Chump change considering sellout crowds in big arenas. Actually, it’s chump change to provide adequate security. Jeremy Foley’s been doing it for years at Florida and nobody has stormed the field at Ben Hill Griffin Stadium or the court at the Stephen C. O’Connell Center. All those checks he writes out to law enforcement add up, but they’re nothing compared to paying off a lawsuit if someone was permanently hurt if a goal post collapsed or a backboard came down. The price of security pales against the price of someone hurt or even killed. Since $5,000 and even $25,000 fines don’t act as a deterrent, however, why not put some real teeth in the fines? How about $50,000 for a first offense? How about $100,000 for a second offense? How about $250,000 for a third offense? Larry Vettel has suggested that the fine is paid to the visiting team. That’s not bad. Or, how about half to the SEC and half to the visiting team? Asked earlier in the week if he’s in favor of increasing the fines so they take a chunk out of the wallets, Foley just smiled and said, “I’m just one vote.” His vote is a voice of reason in the Southeastern Conference, but he’ll have to have some help to ensure that there is a bigger commitment by the league to make the post-game safety of players and coaches a bigger priority. SEC Commissioner Mike Slive needs to step in here and propose penalties that will force the schools in the league with lax security to re-think their position. Back in January of 1969, the late, great Jack Hairston, then the sports editor of the Jacksonville Journal, called me on the phone one night and asked me if I wanted to work for him. I said yes. The entire interview took 30 seconds. It's my experience that whenever the interview lasts 30 seconds or less, I get the job. In the 48 years that I've been writing and getting paid for it, I've covered Super Bowls, World Series, NCAA basketball championships, BCS championship games, heavyweight title fights and what seems like thousands of college football, baseball and basketball games. 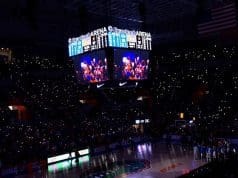 I'm a columnist and special assignments editor for Gator Country once again, writing about the only team that ever mattered to me, the Florida Gators. Since 1997 Gator Country's been the most trusted authority on all Florida Gators sports. Join the most active Gators forums and get the real inside scoop on Florida football, recruiting, basketball, baseball and all University of Florida athletics!